Cranberries: Knowing and Loving Them! Tart . . . Tangy . 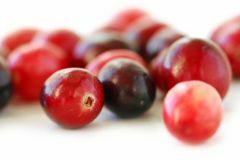 . . we used to think of cranberries only as something that appeared as a sauce on the table on Thanksgiving. Grandma, and maybe Aunt Betty, were the only people who actually ate much of it, though. But now, you can find these red beauties being used in cereal . . . yogurt . . . bagels . . . cookies . . . soft drinks . . . salads . . . energy bars . . . cakes . . . breads . . . turkey, pork, chicken, and ham main dishes . . . and candy (with chocolate!). And you can probably easily add some more to this list. New recipes using fresh, frozen, or dried berries are popping up in cookbooks and the internet and quickly becoming favorites. Click on some of these new favorites now! Look for BOUNCING BERRY ALERTS, that is, information and fun facts bouncing in red throughout the recipe pages. And here's the first one: Did you know that "cran-beauties" have small pockets of air inside that cause them to bounce? (Drop one on your kitchen floor and watch your cat bounce to play with it!) These pockets of air are also why the berries float on water. Click for The Life of a Cranberry From Harvesting to the Store to see what bouncing has to do with you buying this fruit to make these new favorite recipes. Remember that all recipes on vinegar-delicious.com have vinegar as a common ingredient.